XENIA 74 is the flagship of Fleet Xenia, the most awarded catamaran fleet in the caribbean, and is the only Privilege 745 available to charter in the Caribbean. She is a true luxury charter catamaran that combines both luxury and comfort for a wonderful sailing adventure. Accommodating up to 8 guests in 4 contemporary and well appointed lavishly furnished cabins, this deluxe catamaran has one king master cabin, (makes an extraordinary honeymoon suite) and three equal queen cabins. Offering first class comfort and plenty of fun and breathtaking 360-degree views, set an upscale tone of understated elegance. There is an abundance of external living space on board: located above the main cockpit, the teak stairs will take you to the generous fly bridge with a second al-fresco dining area, complimented by further seating and sunbathing space. The higher bridge deck provides quieter and comfortable sailing. The spacious master cabin is truly spectacular, occupying the entire forward section of the yacht. The large, deluxe bathroom has dual sinks and a luxurious bathtub. The spacious bedroom has a romantic, king size bed and lovely settee, perfect for relaxing with a glass of wine and a good book. Opening hatches over the bed allow guests to enjoy cooling trade wind breezes. XENIA 74 has three additional equal queen guest cabins, beautifully furnished with fine linens and designer toiletries. Each of the four cabins feature Hydro massaging showers and air-conditioning 24 hours a day. 4 cabins: 1 King master suite with luxurious bathtub, 3 queen master suites. All cabins have private ensuite electric heads. Yacht is fully air-conditioned. Beautiful upper deck lounge with 360 degree view, cockpit for alfresco dining and lounging, forward trampoline area for lounging and main salon for lounging and dining. Salon has a 52´ 3D TV linked to directTV and apple TV server. Every guest cabin has a 27´ LED Apple TV with SatTV, hundreds of movies on our server. Goose down comforters and pillows. 1 dive per day max. 3 per week. Diving currently offered in VI only. Please inquire about other locations. First Mate is the Dive Master. Diving is only for certified divers. If you have not dived in 5 years we ask you take a refresher course before diving from the yacht. Costs included for certified divers only. BCs, regulators, tanks, weight sets included. If the yacht can not provide equipment for you, we will work with you to rent what is required. Bring your own wet suit or rent one locally. Tony and Kate have been involved in the Crewed Yacht and Villa hospitality business in the British Virgin Islands since 1999. Tony was previously captain and Kate the chef of successful charter yachts in the BVI for eleven years, and provided over 150 high quality charters. This was followed by six rewarding years as Estate Managers and chef at Golden Pavilion, a luxury home away from home and rental villa on Tortola. 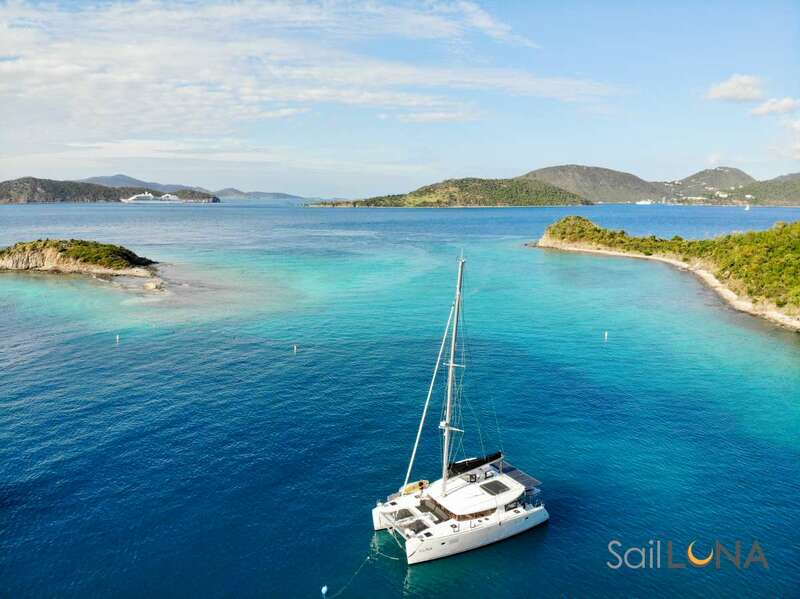 Soon after arriving in the BVI they realized what a wonderful place it is and have made it their home ever since. They built a house here in 2011 in Little Bay, Tortola. Kate and Tony love to show their guests the secret hideaways of the British Virgin Islands and their favourite haunts. They will show you some unique island experiences and their enthusiasm and love for the British Virgin Islands and the Caribbean waters will shine out. The joy of the water, the sailing and the physical beauty of the islands has keeps them looking forward to every day. They love to share their knowledge of the islands and the seas with all their guests, thrilled that the profession that seems to have chosen them allows them to meet so many interesting people from around the world. Tony and Kate chose to leave their successful, rewarding and demanding positions in the UK in 1997. They combined their knowledge and skills to sail their 70-year-old classic 32-foot wooden yacht from the UK, via France, Africa and South America to the Caribbean where they cruised for two years. Later, they also sailed their yacht Roxane, which they owned and maintained for 20 years, via Cuba, the Dominican Republic, Turks and Caicos and the Bahamas to Virginia where she now rests. Born in Cheshire in the UK, Tony enjoyed an idyllic childhood, and took up sailing as a young boy when his father built a sailing dinghy in their garage. He went on to captain his first yacht at 16, delivering a boat along the south coast of England. Tony is now RYA Ocean Yacht master and BVI Boat Master 100 Ton License Grade 1 with over 40,000 sea miles. In 1981 he was awarded a BSc (Safety and Hygiene) from the Engineering Department of Aston University which started a career as a Sales Engineer. This took him onto oil rigs, down coal mines, into sweet factories and every kind of industry in the UK. A career change led him into a rewarding time as a teacher where within three years he had a Masters Degree in Primary Education and employment as an Advisory Teacher. He went on to run a project for Greenwich Education Authority in London providing services to the 300 schools throughout Greenwich. Tony continued his interest in sailing and when his thoughts turned to travelling he sought out and purchased his yacht Roxane in Spain. He lived on her whilst teaching in London where he met Kate (the lucky chap!). Kate was born in Malta and spent her childhood in Northern Ireland, the UK and Hong Kong. As soon as she could, she left home and carried on travelling, spending several years working in the summers and travelling in the winters. Eventually after buying a house, she settled in London and took up sailing. Deciding that a boat would be much more interesting than a house, she bought a Dutch barge instead and lived on it in a marina in the centre of London. Being paired with Tony and winning in a dinghy race one day led to the start of their relationship which was celebrated with the winning prize of a lottery ticket on the first ever National Lottery. They won 10 pounds - and have been laughing about life together ever since. Kate has been in the food preparation industry since 1984 and for several years was the manager of a small food retail chain throughout the railway stations of London. She has worked as a chef on yachts and in villas since 1999 and has loved pretty much every moment. She has attended a culinary course in France and has a food certificate from her early days in the food industry in London. Kate´s close involvement in life in France has enabled her to learn firsthand the delights and rewards of delicious French cuisine. She has expanded her culinary skill and knowledge throughout her life. Kate has recently contributed to a recipe book with other top chefs from the island and appeared on the local TV show ´Gourmet Galley with Chef Lisa´. In addition to her chef and management duties at Golden Pavilion, Kate has also provided chef services for other prestigious villas and establishments, notably the Governor of the British Virgin Islands and the owners of Amway at Peter Island Resort. Kate and Tony enjoy an adventurous and busy life together and embrace hard work with vitality and enthusiasm. Charming, fun and great company, they are complete all-round hospitality winners. They work well together under pressure and routinely handle all that the hospitality and sailing world may demand of them and have fun on the way. Tony and Kate have had a home in Brittany in France since 1991 and when they are not in the BVI´s, they can be found drinking wine and eating cheese with their neighbours in France. NICO JANSE VAN RENSBURG - 23 years old. Born and raised in the southern tip of Africa, I spent many a holiday on safari with my family where my love for the outdoors has grown deeper with every trip. But even in these early days the attraction of water was strong, and I ended up pursuing that as an open water swimmer. After school the oceans started calling and I soon realised where my true passion lay. I started my journey of yacht training and diving courses. I worked for a time on The Sustainable Seas Trust vessel, Boaz. This enabled me to accumulate not only invaluable experience but also notch up some sea miles. Following this an opportunity opened up for me working for a fleet of large charter catamarans in the fascinating country of Turkey. Today, learning not only yachtsmanship but the skills required in the hospitality industry. I am a now a qualified RYA Offshore skipper and also an enthusiastic PADI Dive Master. Enjoying every moment above and below the waves I am now starting a new adventure with Xenia 74 and living my dream in the Caribbean. I cannot wait to share the wonders of the BVI and the reefs with our guests. Hailing from New Zealand, where beautiful beaches are plentiful, Katie has always had a love for the ocean. Growing up, her uncle and aunt who worked on crewed yachts for many years filled her head with stories of sailing the Caribbean, where the water is crystal clear and there is always a Shaggy song playing somewhere. She was enticed. Before running off to become a sailor she completed a Bachelor of Communications (at her mother’s request!). Six months later Katie was on a one-way flight to the Virgin Islands where she stepped off the plane and onto Xenia 74. On board, you can typically spot her with a wine bottle or cocktail shaker in hand (she makes an amazing painkiller!) or trying to create intricate napkin folds for the dinner table. When she isn’t on the boat you will find her at a beach bar sipping on a Bushwhacker or more likely patting a dog somewhere. She can’t wait to welcome you aboard with a glass of champagne! Offer: Xenia 74 is offering a last minute discount of 15% for any charter beginning or ending in April 2019. Send us an inquiry to get specific pricing for Xenia 74. LOVED EVERY MINUTE! Decadent Crazy Fun. Thank you Tony for taking great care of us! Events to remember - Tony’s dancing, music, all of Kate’s meals!!! Beautiful presentation and delicious! Thank You Kate for cooking ALL vegan for Ken and Car. We loved it! Tony, Kate, Katie and Nic all have a place to stay if you come down San Diego way! All made this a spectacular trip. From the guidance and flexibility of Captain Tony to the attention to cuisine and flavors at every meal, to Nic’s ability to allow us to experience all things and keep our ship tip top, to the beautiful table settings and sparkling eyes and personality of the adorable Katie, this crew was the best we could have imagined. Amazing Boat and 5 star meals and drinks. Plenty to do every day in-between the laughter and fun. The crew is First Rate - Tony and Kate, Katie and Nic are the best and made us immediately comfortable in unfamiliar surroundings. Sunny days, late breakfasts, water sports, island walks, bar hopping, storytelling, motor and sail, beautiful rooms, incredible service, our every wish honored and a full moon rising. We loved every moment of our adventure and love the crew. This adventure is simply one of the best. Leslie, Rosemary, Ronald, Amy, Joan and Sean. The Top Class crew of Xenia 74. Kate your cuisine can’t be beat. Katie you giggle is ever so sweet. Nic you rescued us from the deep. And Tony has steered us awake and asleep. Thank you for an amazing trip. For the professional way you kept us from harm. We will never forget this beautiful boat. But most of all your kindness and charm. Staff on the ship were excellent! Chef Kate made excellent meals. Katie and Phillipa served and spoiled all 8 of us. Captain Tony is an excellent Captain, taking extra effort to make sure we were all safe throughout.. Love the vacation and walked away with an adopted Granddaughter Katie. We had an absolute blast on the trip. The Xenia 74 is an awesome boat, huge master suite, great other bedrooms and really nice outdoor space. The crew was amazing. Kate is a fabulous chef and we marveled how she could accomplish so much in a tiny kitchen. She kept us well fed with delicious breakfasts, lunch, snacks and dinner. Adam was a great first mate, friendly and outgoing, great with my kids and generally fun to be around. Katie was a great stewardess, always there with a drink or anything we need and super friendly and outgoing. I can’t imagine having a better captain than Tony. Clearly he has been doing this a very long time, he knew everything about the islands and where to go and not to go. He is very adventurous and fun which was a great fit for my family and even took the kids on several treasure hunts through the islands and even had them bury some treasure of our own for others to find. I would recommend the boat and crew to any of your clients and will definitely send some of my friends your way who are now interested in the trip and tell them to book the Xenia 74. Thanks for getting everything set up so seamlessly for us. Sign me up for the newsletter for sure. The crew was phenomenal! Tony is tremendous fun, Kate is the most amazing chef, Katie and Remi are jacks of all trades and masters of all. They truly made our family vacation and birthday celebration the best it could be! Ken, Liz, Kevin, Laurie, Kenny, Paige, Tommy and Brooke. This vacation ranks up there with one of the best vacations we have taken. Many times we said to each other that this couldn’t be real, it was too good to be true. Each day was relaxing and stress free – just as we wanted. We can’t rave enough about the captain and crew. Adam was the perfect scuba guide, showing us all the awesome underwater sites and keeping us safe. Katie kept us well hydrated and made sure we were having fun. We knew we were very spoiled when she delivered drinks and appetizers to us while we floated off the back of the boat on the inflatable raft. Kate worked her food magic on us. We still can’t believe the meals she was able to produce from a boat galley. It was like fine dining in a 5 star restaurant every day! And all the while, Captain Tony made sure our travels were safe and enjoyable. His knowledge of the islands and local landmarks were very appreciated. The meals were fantastic! Kate definitely paid very close attention to our sheets and our expectations were exceeded. The yacht was very clean and well maintained. Cabins were great. There was plenty of shade and sunny lounging areas. We also enjoyed listening to our music over the sound system. Most liked – large lounging area in front. Least liked, maybe the many steps in the master bedroom as they are kind of treacherous in the dark. But honestly, I almost feel guilty even mentioning that because we really loved everything about that yacht. Pace and itinerary were perfect for our group. We described what we were looking for and Captain Tony and mother nature delivered! He was able to take us to out of the way quiet spots, which was just what we were looking for. And, he also found beautiful, breathtaking spots to anchor at night. The diving and snorkeling was great. Tony knows a lot about the various islands which helped us make decisions and try new things in different islands. Beware the circle of death! (the island float ). Kate’s meals were all amazing! WE all gained at least 5 Pounds! Best crew and vacation ever. My husband and I, along with friends, had the great pleasure of sailing with Tony and Kate the week of June 29th through July 7th on the beautiful Xenia 74. We had never been to the BVI, so the entire trip was a new adventure for us. The ship and the crew combined to make this a once-in-a-lifetime, never-to-be forgotten experience. Thank you for providing us the best Captain in the Caribbean, Tony. Tony’s masterful command, not just of the ship, but of the entire experience, was comforting, reassuring and perfect for first-timers. He made everyone feel at home and even joined us as we played games on the aft deck at night. He is funny, but in command; truly a sincere and gracious host and a very capable Captain. For us though, the real star of the trip, was Kate and her cooking. Oh my goodness, Kate created a Michelin-starred restaurant on our boat. Each meal was not only beautifully and tastefully prepared, but creative and delicious without being pretentious or overthought. She is a remarkable chef and along with Tony, they make the perfect couple to manage the boat and its guests. The rest of the staff was very hospitable and warm as they delivered outstanding service to all on board. Katie and Kerry took care of our every need – sometimes before we even asked. They were super customer-focused and fun to be with. In fact when we returned home, my husband and I often remarked how much we missed Katie asking us, as she did multiple times throughout the day, “What can I get you to drink, eat, etc.” They all made us feel special and welcome on the beautiful cruise. The relaxation, fun, food, and friendships of this voyage will stay with us long after our return home. Thank you for providing such a comfortable, clean, well-equipped yacht for our journey. And huge thanks to Tony, Kate, Katie and Kerry for giving some Texas landlubbers the cruise of a lifetime. After a long day of travel, we are back home in San Francisco. My recommendation to you, Patty, is to recommend Xenia with your highest praises. Xenia 74 should be first choice for your charterers. The boat itself was clearly the finest in the Caribbean. And, while the boat and location are enough to make a very memorable trip, it was the crew that took the trip to extraordinary levels. I have no experience with other crews but I cannot imagine a better crew than Bernie, Matt, Angie, and Dessi. Home made fresh baked pastries served each morning with - Tea, Coffee, Juices and a Fruit Platter e.g.